Here are two famous late 19th century Neapolitan songs – a genre that I am fond of. “Funiculi Funicula” was composed in 1880 to commemorate the opening of a funicular railroad that ran up Mount Vesuvius until it was destroyed by the volcano’s 1944 eruption. “O Sole Mio” was composed in 1898. 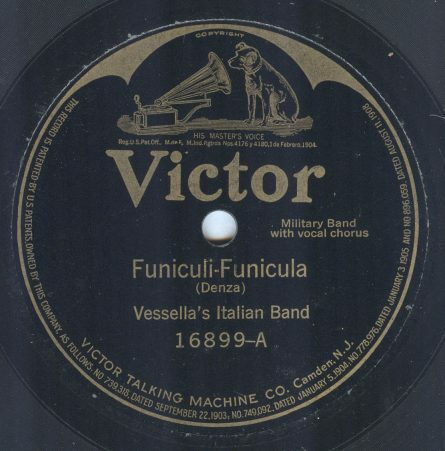 Vessella’s Italian Band recorded for Victor, Brunswick and Edison. Its leader, Oreste Vessella was born in Italy in 1882 and emigrated to the United States in 1901. This entry was posted in 1910s, Acoustic Recordings, Ethnic Recordings. Bookmark the permalink. My great grandmother, Marie Bassini imigrated to America in 1904, a little after this band leader did, but she was a young child at that time. If you would like to be informed of new postings you can receive updates by following the blog's Twitter feed.